A set of photos posted to the Web on Wednesday supposedly show a next-generation iPhone partially assembled from leaked parts being measured with a pair of calipers, revealing the device is slightly larger than current models in all dimensions. 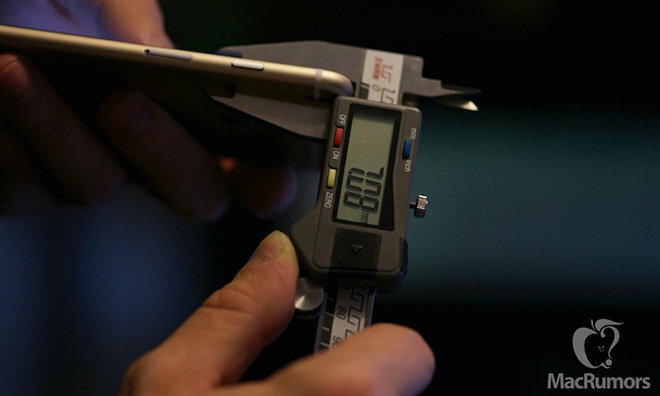 As seen above, the device as measured with supposed iPhone 6s shell and display installed has a thickness of 7.08 millimeters, or 0.19mm thicker than the iPhone 6. The results published MacRumors appear to be congruent with multiple reports claiming Apple's upcoming handset will be a hair thicker than the iPhone 6. Well-connected analyst Ming-Chi Kuo said in June that he expects a 0.2mm change in thickness for both the iPhone 6s and 6s Plus, a modification made to accommodate embedded Force Touch sensors. AppleInsider's own sources expected Force Touch integration in February. There has also been speculation of a material upgrade to stronger 7000 series aluminum in a bid to avoid flexing, though it is unknown at this time if such a change affects device thickness. Today's photos also reveal minute differences in height and width, with the new part measuring 138.19mm tall and 67.68mm wide. This compares to Apple's iPhone 6 specifications of 138.1mm and 67.0mm and is similar, but not identical, to measurements taken off another iPhone 6s shell "leaked" in August. It is unclear if the slightly larger dimensions also apply to an expected "iPhone 6s Plus" device. Current iPhone 6 Plus hardware is already 0.2mm thicker than its iPhone 6 counterpart, meaning an identical alteration would bring it up to 7.3mm thick. Considering the parity of existing models, however, an across-the-board bump in thickness is likely. Apple is widely expected to announce this year's iPhone models at a special event on Sept. 9. AppleInsider will be providing live coverage.